OH HOLY JEEBUS OTTER....WHAT HAVE YOU DONE TO ME?!?! Happy Halloween! Just because I'm the Halloween Grinch doesn't mean I won't subject you to horror on this scary day. *sigh* Yes! There is a Halloween Grinch! I don't know why no one remembers this? In case anyone is wondering, it is actual Dr. Seuss, and it was intended to be a prequel to the Christmas Grinch. You're welcome! 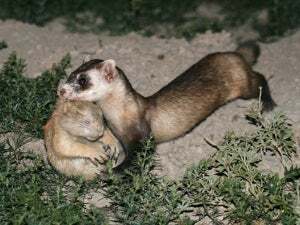 Anyway, that cute ferret up there is the Black Footed Ferret, and it lives in the western plains and rockies area of North America. Well....small sections of those areas, at lest. They are related to otters! Remember when I got all science-y on Tuesday? Well, this ferret is also known as the American Polecat. So, it shared mitochondrial DNA with otters. That means they're fairly closely related. So, other than the fact that the picture up there shows animal murder, what's so horrifying about this ferret? I'll tell you. It's not the fact that it kills and eats prairie dogs as it's main source of food. It's how it kills them. Don't be embarrassed. It happened to most people. And by most people, I mean, most people who have ever lived, ever! There's a reason we tell stories about 'things that go bump in the night' to scare people. And that's what's so scary about this ferret. It is the creature that goes bump in the night! It's main method of killing the prairie dog is to wait until night when the colony goes to sleep. It then sneaks down one of the holes and into the sleeping areas where the prairie dogs are sleeping. It then uses it's front paws to make a ball and......it bonks the sleeping prairie dog on top of the head. This causes the prairie dog to wake up and raise it's head up to see what's going on. When it does that, the ferret lunges for the neck and kills the poor prairie dog. Fret not, for the poor thing does not suffer. The ferrets dispatch their prey as quickly as they can so they don't alert the rest of the colony. If the rest wake up, then no other ferret will eat that night. It's not good enough for the ferret to just kill it's prey while it's sleeping. No, it has to bonk it's prey on the head to wake it up first. Not scary enough for you? Well, hows this? Pauley Shore is in talks to write and star in a movie adaption of Gilligans Island. He suggested Kevin James as the Skipper, Russell Brand as the Professor, Lindsay Lohan as Ginger, Ellen Paige as Mary Ann, Donald Trump as Mr. Howell and Shelly Duvall as Mrs. Howell.